I’ll admit I have a short temper. Sometimes it’s with an applicance that doesn’t work. Sometimes it’s triggered by muddy shoe tracks around the house. Sometimes by my son, who is being his 3-yr-old self but making a mess and racket while doing so. I try to work on it as much as I can- but there are times when I blow my fuse. Cooking and being in the kitchen, however, makes me forget whatever it was that made me angry. I’m happy to toss a salad. Shake some vinaigrette together. Chop some onions into half-moons, dice tomatoes and slice cucumbers. And if my son has been punished, then a snack is what is produced as a peace offering. Happy as I am to prep, chop, cook and stir, there are days when I take the lazy route- that is, cooking without having to stand over the stove for too long. For me, lazy cooking is about chopping some vegetables, roasting them in the oven, and tossing them with pasta, creating a salad, or blitzing everything into a soup. The great thing about roasting veggies in the oven is that the oven does all the work for you…the natural sugars come alive, the juices come out and the vegetables just dress themselves, absorbing all the lovely flavours of the herbs and oil. If you think garlic sautéing in butter/olive oil is one of the nicest (savoury) aromas, think again. 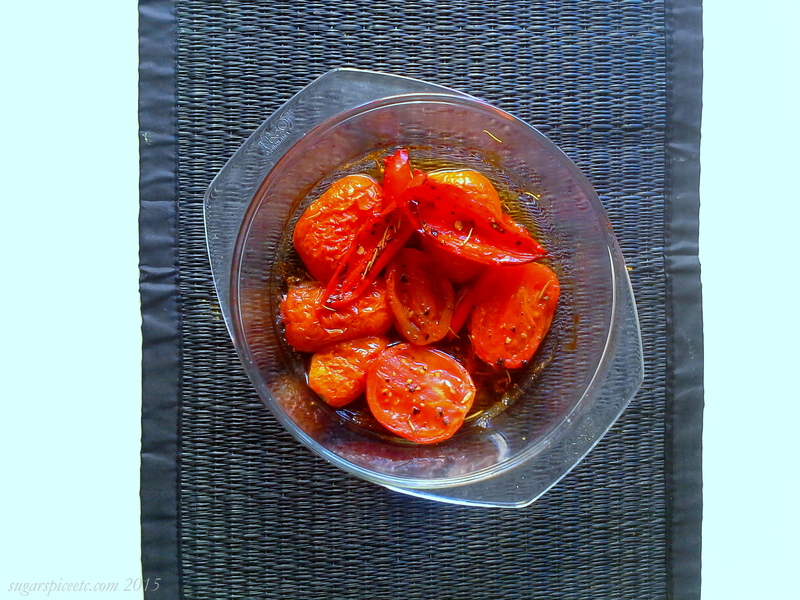 Tomatoes and peppers roasting in the oven with rosemary is an aroma that can make any stomach growl. Ever since I tried Clara’s blistered cherry tomatoes, I’ve had a weakness for roasting tomatoes in the oven- big and small. I agree, cherry tomatoes look prettier when roasted and paired with pasta or a topping for a tartine, but when you are roasting tomatoes for a soup, it doesn’t matter. 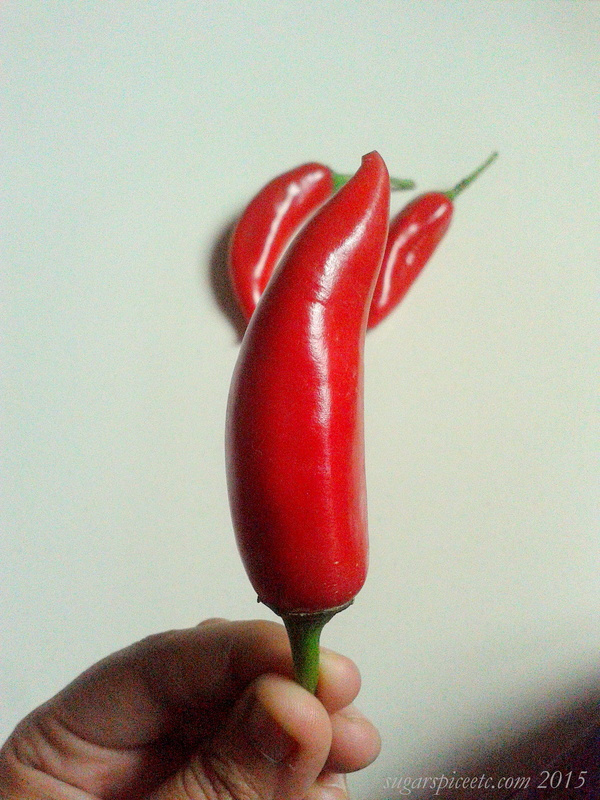 I also found these red chillies in the market earlier this week, and was a little undecided about what to do with them. Anita suggested pickling them, which I intend to do, but I was impatient to get cooking with them, so I slit, de-veined and de-seeded them, tossed them with chopped tomatoes, olive oil, garlic, thyme and crushed pepper, and put everything in a 200 degree oven for 40 minutes, with a gentle toss and massage after 20 mins. Once done, I blitzed everything in a blender with a little water, and added the mix to a pot of simmering lentils- dinner is done. Place the tomatoes, peppers and garlic in a roasting tray/baking dish and toss with the olive oil, thyme, salt and pepper till well coated. Place in the oven for 40 minutes, checking on them after 20 mins and giving everything a quick toss. Once cool, place everything in a blender and blend, adding a little water, till smooth. Place lentils in a large pot and add enough water to cover. Simmer on medium-low heat until lentils are tender, skimming off the foam at the top periodically. Once the lentils are tender, add in the tomato-pepper puree and cook, stirring occasionally, for a few minutes more. Add more water or vegetable stock if necessary. Season with more salt and pepper if you wish, and drizzle some olive oil over the top before serving. Don’t go by how these look- I know they don’t look too pretty. But I guarantee they taste wonderful! A perfect combination of salty & sweet, gooey & crunchy. And it takes just half an hour to put together, including the baking time. 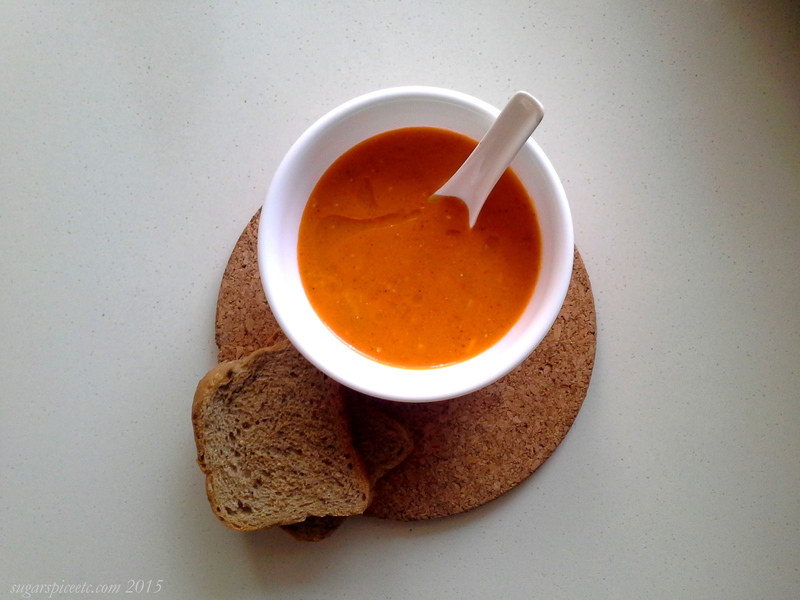 This recipe comes from Anna at The Yellow Table, one of the inspirations behind this series. What I love about Anna’s blog is her focus on entertaining, and how to put together menus and parties for every occasion. She has some great appetizer recipes, ranging from ridiculously easy (like this one!) to more sophisticated but still simple stuff like crostini. The dates soften and caramelize a little during their time in the oven, and the bacon strips get nice and crispy- it’s a pretty much to-die-for combination. I pitted the dates and added some slivered almonds in the middle, but you can use cheese, too- that would make for a more indulgent bite! So seriously- the next time you have a party, ditch the chip & dip, trash the tartines and avoid the antipasti. (It’s been awhile since I alliterated, folks! I was itching to!) Just wrap some dates in bacon and stick ‘em in the oven like so. Your guests (a long as they’re not vegetarian/vegan) will be happy. Place an almond sliver in the middle of each date. 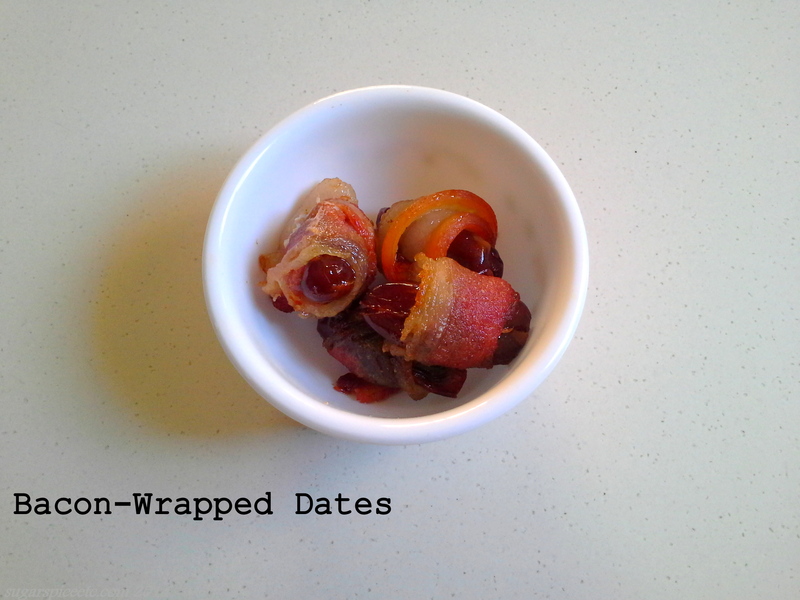 Wrap each date in a strip of bacon, wrapping the ends under. Place on a baking tray/sheet, and bake at 190 C for 15 mins until the bacon is crisp and golden. After weeks of sweets and baked goods, it’s time to switch things up with some savoury sides for the holidays. 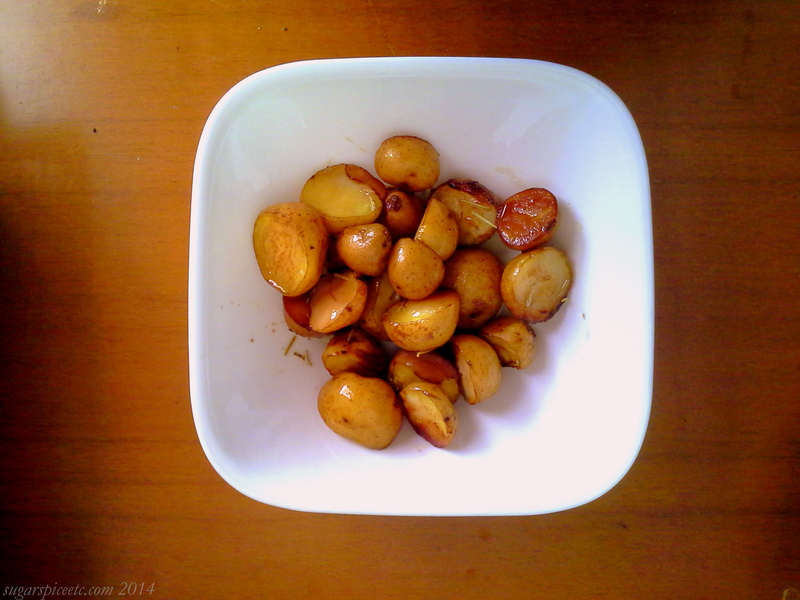 And no Christmas table is complete without a side of potatoes, in some form. I love rosemary potatoes, it’s a classic combination, easy to prepare, and is an agreeable accompaniment to all kinds of meat. There are enough rosemary potato recipes out there, from Jamie Oliver to Ina Garten and even Popsugar + Sorted Food. Most of the recipes I make here come other bloggers and food websites, or from cookbooks I own. But today’s recipe comes out of an old issue of Vogue India! The magazine did a feature on Padma Lakshmi and her favourite holiday recipes, and I went old-school and cut out a few of them for later. Each of the recipes differs from the other, but is the same at it’s core. Ina adds some minced garlic, the Popsugar recipe calls for a little truffle oil and JO leaves his simple and unadorned, just olive oil+salt+pepper. Padma’s recipe calls for balsamic and a wee bit of sugar, which adds a lovely sweetness and tang in contrast to the woody rosemary. Place the potatoes in a single layer in a shallow baking pan. In bowl, whisk together olive oil, balsamic vinegar, rosemary, sugar, and black pepper. Drizzle this over the potatoes so they are evenly coated, then sprinkle with salt. Bake at 220C for 20 to 22 minutes.